I decided that 1:35 pace was absolutely as slow as I wanted to go for this, and so set a plan of 7 hard strokes, ease off to 1:35s, then push hard again close to the finish. I set 30sec splits to keep myself honest through the middle of the row. This row is pretty consistent rowing even for me. Just those few hard strokes at the beginning, and a push for the final 30seconds at the end were enough to make the overall average pace about a second quicker than the pace I was rowing at for the majority of the row. A good lesson in how to achieve a certain pace target in a race or time trial doesn’t mean that you have to row at that pace from start to finish. Setting a “no slower than” pace through a middle of any race or time trial row is a good way to do it, and generally this will be 1 or 2 seconds slower than your ultimate target split at the end. Whether this is 1 or 2 really depends how aggressive you intend to be in the final sprint. When it comes to a race I would be a lot more aggressive than I was here. The final core session of Week 4 today, and a 5k split as 3k at 1:45 and a faster final 2k. It has been a busy week so all I have done so far has been the 3 core session, and no steady distance work. These solid middle distance pieces are an important part of the overall training programme, and really cement the mental strength built during the longer interval sessions. It takes a while to build up enough mental strength to really push on them, and for 5k rows I always find it best to split them into 3k / 2k, with the first 3k somewhat sub maximal, even for flat out 5k pb attempts. Within the row I then approached this one as a 10 x 500m session, albeit with no rests between the splits. 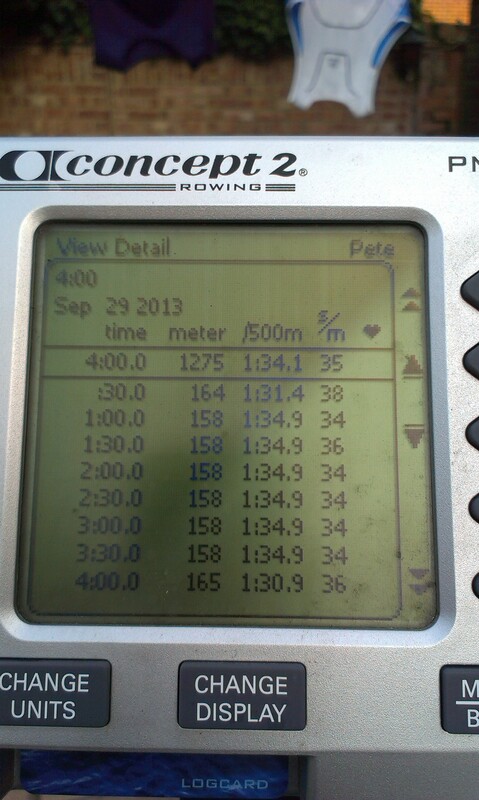 So the target was simply to hit 1:44.9 / 1:45.0 for the first 6 x 500m splits, then a bit faster 500m to 500m for the final 2k. Good enough 4 weeks in, but I really need to get down to 16:59 to put myself into the kind of shape I want to be in. Another good solid session today, on another day where I didn’t really feel like doing a hard session. Having your training planned out for the week makes it much easier to get the sessions done rather than making it up as you go along. Just write down at the beginning of the week (or 2 weekly period as I generally do) which sessions you will do, and targets for them, to take all of the guess work out. I always have 3 core sessions, or harder sessions, each week and make up anything else with steady distance work. So my priority is always to get the 3 core sessions done every week no matter what. The final two sessions that completed Week 3 of my build up to Bristol and BIRC were a 1k time trial, and a 4 x 7min30s reps session. The 1k was always going to be very alien feeling having not done any sustained pieces at this type of pace in a long, long time. My target was to break 3:05, and do so with a quick start, then into a (relative) cruise before slowly building the pace to the finish. All in all I was happy with that session. A strong finish, a good enough pace overall, and a good solid piece. For the same effort level I am usually very consistent with a 5second pace differential between my 1k and 2k, so this would predict a 6:28 time for 2k. I emphasise that this is what works for me, not that it is a rule that will work for everyone. This is pretty much where I would put myself at 2k last week as well, I could break 6:30 but not a whole lot quicker. Apart from the fact that I was sure I did enough on the final rep to see an average pace under 1:45 in the PM memory, I was happy with this session. I was working hard throughout, hence the ease off in rep 3 to ensure I would get to the end of the session, but always thought I could achieve my 1:45.0 overall target. Into Week 4 today with the first core session of the week. I had been looking forward to this one since I put it into the plan. I’m not sure if this was a perfectly paced session, a perfectly targetted session, an over-ambitious first 3 reps target pace, or a slightly poor mental effort on the final rep. Whichever way, the training effect will be very strong from it. In reality the target was a flat pace for the first 3 reps, and a faster final 1k. I picked the quickest pace I thought I could sustain over the first 3 reps at 1:36.0. In rep 1 I thought this was going to be a pretty straightforward session. The first 1k rep did bite a bit though. The second 500m was ok, but I knew then that the final 1k was going to be tough. I was sure I could make the target pace, but I wasn’t sure I could exceed it. As it was I cruised a little too slowly through the middle, so a bit quicker final 200m just brought the average pace back on target. It told me what I needed to know though, and gave me a good training effect from the two 1k reps at pace. Overall my fitness, power, and mental strength are building nicely week on week through this phase of training. Bristol is now just under 4 weeks away, but that means I’m not even half way through my build up training yet. Despite saying that I was just going there to do what I could in each race (2k, 1k and 500m) with no particular target, it is impossible not to begin thinking of certain numbers that I would like to achieve given how my training is going. If today I am around 6:28, 3:04 and perhaps 1:25 for the 3 distances as hard time trials, then I have to be looking to go at least a few seconds quicker than each of those on race day in 4 weeks time. Of course doing all three in one day will impact the second two races somewhat, but that doesn’t concern me. In the whole scheme of training it is often the days where you just don’t really have the time or desire to train but do it anyway that make the difference in the end. Today was one of those days. I’d had a long day on Monday out of the office and home late on my rest day. Today let’s just say that my diet was no conducive to good training after a lunchtime meeting in the pub. But I got home from work, warmed up, and got on with it anyway. So far I have done 6 x 600m (2r) in week 1 at 1:36.3 average pace, and 4 x 800m (3:30r) in week 2 at 1:36.0 pace. Today was in the middle both on rep distance and rest time, but 400m total session distance greater than the 800m reps last week. The aim was to do roughly the same pattern for reps 1 to 4, all sub 1:37, then hopefully have something left for a quick last rep. So nicely on targets, but the general condition tells by the rate being 1spm higher, and the fast last not being quite as quick as the past 2 weeks. Marginal things, but that’s what makes the difference on race day. But understanding, recognising, and compensating on your approach to the session is a great asset to have in your tool kit. Sometimes your choice of training location should be thought out a little more. I prefer to row out on the patio if I can. If there is a chance of rain I put a ziploc bag over the PM4 to stop it getting wet. The rest of the erg is fine, you sweat all over it every session, so a little rain won’t hurt. But what do you do if you want to do your session on rowpro, so need your laptop too? I don’t have a ziploc bag bin enough to contain my laptop, so had to resort instead to clingfilm. It was a good move, it did rain fairly heavily for the final 15mins of the session. Unfortunately 2 layer of cling film over your laptop screen do obscure your viewing a little, though surprisingly the touchpad mouse was still usable. A bit too fast really for a steady day, but with the stroke rate it was still fairly light work, so I should be good for the final core day of the week tomorrow. I was close to putting today’s session off until tomorrow. I could think of lots of good excuses. I didn’t train on Wednesday or Thursday as I was at a work show in London. I didn’t get home until after 10pm last night having left before 8am, and had a few beers in London with some guys I used to work with before heading home on the train. I didn’t feel good. It looked like it was quite likely to rain. But if I put the session off until tomorrow then that would mean 3 days off in a row, and that is never a good thing, and then I’d only have to do the session tomorrow anyway. 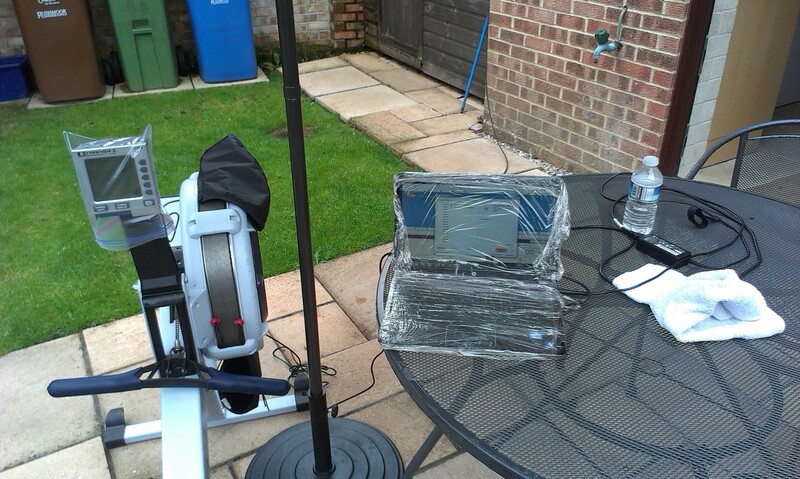 So I wheeled the erg out of the garage to the patio, stuck a ziploc bag on the monitor in case it rained, did a 5min warm up, and off I went. I don’t ever deliberately slow down mid session, but it was feeling hard after 5 reps, and I wasn’t sure I could get to the end of the session if I kept pushing for sub 1:45 pace. 1:44.9 to 1:45.3 might look like a pretty small change in pace on paper, but it’s just enough to make the difference. I also wanted to keep myself close enough to be able to pull the average pace back on the final rep. Oh, and coincidentally it did rain throughout the final 3 reps! The 1min rest periods between reps were really feeling very short in the second half of the session. I wonder how I ever managed to row routine 10ks under 1:45 pace as single rows a few years ago, and certainly how I got down to 1:43.1 pace for my pb. But then I’ve made big gains over the past few weeks back much closer to where I used to be, so who knows how much closer I can push myself over the next 3 months to BIRC. Into week 2 of the BIRC build up plan now. In week 1 the speed session was 6 x 600m / 2min rest in which I managed a 1:36.1 average pace at 33spm. The reps today were 33% longer at 800m each, but in turn the rest was also 90second longer than on the 600m reps last week. On speed reps like this any increase in rep distance does make the session that bit harder though, unless the rest periods are disproportionately longer. However, I expect to make fairly rapid gains over the initial few weeks of this new plan, and therefore aimed for the same pacing pattern as last week’s 600m reps.
All in all a good solid session. A marginally faster average pace at the same stroke rate. Following on from the 5min reps from Friday, today’s workout was a 5 x 1250m with 3min30 rest between reps. When I’m in a period of hard training I always feed off one hard session for the motivation for the next. As I had done the 5min reps just under 1:45 pace on Friday, these reps at around 45seconds shorter with over double the rest period had to be a couple of seconds quicker pace. In turn, from the last blog entry I said that I mentally worked through those 5min reps by comparing them to recent single 5k pieces. Had I simply looked back to the last time I did 1250m reps I would have likely found that I did them with either 4 or 5min rest, and probably no quicker than 1:44 pace. So you have to look at current form, not necessary the exact same session from some time in the past. So that’s where the target came from, and a 1:43 starting pace for rep 1. After the 90sec rest for the 5min reps on Friday the 3:30 rest today felt great. I was aerobically recovered in the first 90seconds of each rest period, but the extra rest time gave me time to take on some water, and stretch my quads a little to keep loose. I knew going through the third rep that it was simply a matter of how much quicker I could do the final rep, not whether I could maintain pace. I love this feeling in the middle of an interval session, as it takes your mind off the next rep and a half until you begin that final rep, and your mind is already convinced that it will be no trouble. Overall another good solid session, with week 1 of the BIRC build up complete. Today’s session was always going to be a fairly tough one. Sometimes you have to put it on the line a bit to make gains though, or at least to see what is possible. I like to call this forced adaption, ie if your force your body (and mind) to go quicker than it wants to then it will adapt to make it easier next time. I said some time ago in my blog that my main aim for this year was to get back to rowing a sub 35minute 10k. I’m never going to do that if I’m doing reps sessions slower than that. So with only a 30min total session time today my aim was to do all reps under 1:45 pace, even though this is the pace I have recently done for 5 x 5mins with 5min rest. So one more rep, and under a third of the rest period. I therefore had to play some mental games to drive through this one. The first mark in the sand was that I have recently done a couple of 5k rows at 1:45 pace, and that is the equivalent of 3.5 reps of this session. So there was no excuse not to do 3.5 reps at target pace as I’ve done that as a one off without the 90sec rest periods. Then with the 90sec rest periods there is then no reason not to get through 4 reps. So that’s 2/3rds of the session complete then. This next one will perhaps sound alien to some, but very familar to others. The penultimate rep I can always treat as the last important rep to get on pace. Why? Because I will be doing the final rep faster, so that’s different and not part of the core of the session, right? I told you it would sound odd. So rep 5 was the only one that really needed some mental focus. Then into the final rep, the fast last, and it’s all down hill. The question now is how do I continue to push on harder and faster week on week for the next 3 months in order to put in a respectable performance at BIRC? Simple, I dwell on the past and tell myself that this is still 2sec / 500m slower than my 30minute PB, and not even a second quicker than the pace of my 60minute PB!